Dressed Treble Hooks will help you catch more fish by giving your hard baits a more action and a better profile! Continue reading "Dressed Treble Hooks Enhance Your Hard Baits"
Flats Buggs excel in shallow saltwater environments for bonefish and other gamefish that are chasing small bait. Learn about the 3 different ways they're fished. 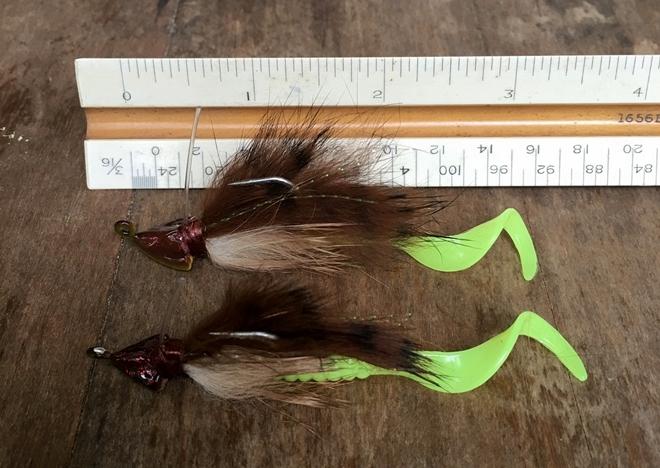 Continue reading "Flats Buggs, the Most Effective and Versatile Light Tackle and Bonefish Jigs"
Continue reading "Buggs Fishing Lures News"
Ratic Shad Buggs feature irrestible action and a realistic profile for stripers, largemouth, snook, redfish, and speckled trout! Continue reading "Everything Eats Ratic Shad Buggs"
This page explains and gives examples of how to build and modify a 3-column template using an external CSS style sheet and inline CSS. Continue reading "Buggs Fishing Lures are inspired by the most successful fly patterns in the world"
Don't worry -- your e-mail address is totally secure. I promise to use it only to send you Buggs News. Copyright © 2016 BUGGS Fishing. All rights reserved.